IN association with Concerts SA, award-winning musician Azah will be embarking on a tour through Eswatini. Hailing from the South African jazz capital Mamelodi in Pretoria, Tinyiko Mpho Mphago wa Mabasa aka Azah is a multi-instrumentalist, composer, producer, musical director, cultural activist, educator and philanthropist. 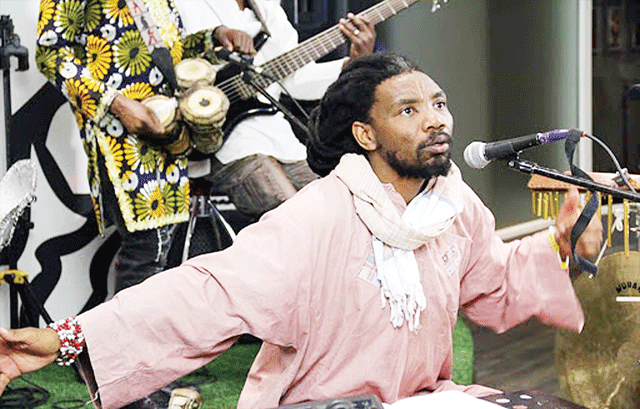 Comprising three live performances, musical therapy activities and a workshop showcasing his spiritual presentation of malombo music, in this Eswatini tour, Azah will lead a Pan-African artistic collaboration between Swati musicians and members of his own band – which includes performers from various African countries such as Togo, Zimbabwe, Nigeria and DRC. The impressive array of local guest performers includes legendary names like Bholoja, Tlale Makhene, alongside young luminaries such as Smiles Makama and Tindzaba Temdzabu. The performances will be supported by visual artist Honest Lihle Mhlanga with a live painting interpretation of words and sound. Esteemed indigenous knowledge systems custodian Joy Ndwandwe- also a researcher and author of three books- will be a special guest and contributor during the various tour activities. Azah and his eight-piece band perform divergent and all-encompassing music that fuses traditional clinical sounds, crossing into world music- incorporating various genres such as highlife, soukoss, jazz, afrosoul, afrobeat, and indigenous folk sounds. In the latter, one can hear the background and influence of malombo (Venda word meaning spirit) sounds, and the kiba expressions of the baPedi people of the Limpopo province. His musical impression has an element which strives to be spiritually engaging. By adding sentimental ballads, industrial and contemporary fusion sounds to funk workouts, the band harmonises in a trance-like mood- multi-facets of transcended dimensions in the spiritual realm that are esoterically simmering grooves like jazz and fusion outfits. Speaking to this publication, he said; “By creating interpretive music together we grant ourselves permission to fully realise our sense of gratitude, pain, exhaustion and wonder. Through clinical improvisation and the use of values of symbols, storytelling, poetry, rhythm dynamics, dance and music, we find the quality of celebration in both our private and public spaces. “Our quest is to redeem (bring back to the original intended purpose) our cultures using the arts (order) as a tool of expression. I am incredibly honoured to have the opportunity to go and share this quest with unbelievably talented artists whom I admire and respect,” he said. Azah’s tour is supported by Concerts SA through the Music Mobility Fund, a funding mechanism which offers opportunities for South African musicians to undertake live music tours.